Ulster's Under-16 squad have retained the Irish interprovincial title by winning all four of their matches against Leinster and Munster. Andrew O'Hare, Luke Witherow and Ben Wallace scored as Ulster started the tournament at Mossley with a 3-2 victory over Munster on Friday. 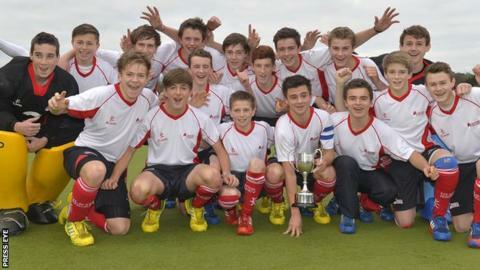 In Saturday's games Ulster beat Munster 2-0 and Leinster 2-1. The Under-16s rounded things off with a big 6-1 win on Sunday over Leinster, with Andrew O'Hare scoring a hat-trick. Witherow scored two with the last goal coming from Kilkeel's David Rae. Meanwhile, the Ulster Under-18 team finished runners-up in their tournament, missing out on goal difference to winners Leinster. It all came down to the last game in which Ulster beat Leinster 3-1, the goals scored by Cookstown's Andrew Smyth (2) and Ross McIvor sealing the win. The Under-18s had defeated Munster 2-1 on Friday afternoon, then fell to a defeat by the same opposition before securing a 1-1 draw with Leinster to keep their hopes alive.